In this section we check that some of the required tools / drivers have been correctly installed and configured. Connect your laptop / PC to the discovery board using a micro USB cable. 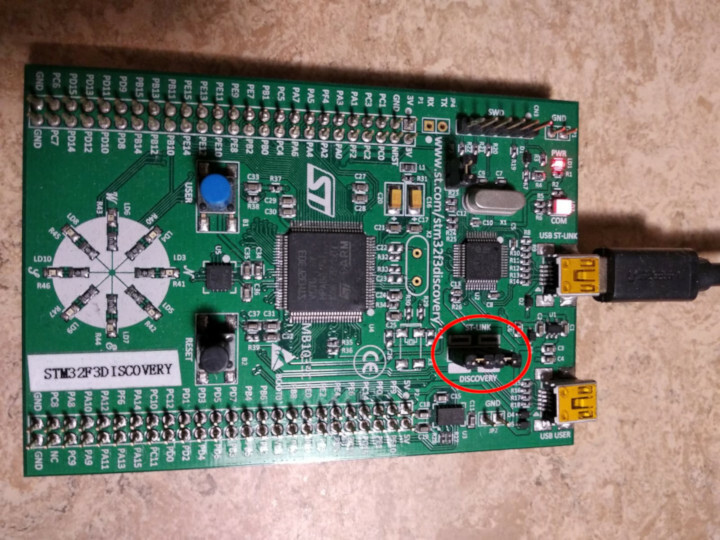 The discovery board has two USB connectors; use the one labeled "USB ST-LINK" that sits on the center of the edge of the board. Also check that the ST-LINK header is populated. See the picture below; the ST-LINK header is circled in red. The contents may not match exactly but you should get the last line about breakpoints and watchpoints. If you got it then terminate the OpenOCD process and move to the next section. If you didn't get the "breakpoints" line then try the following command. If that command works that means you got an old hardware revision of the discovery board. That won't be a problem but commit that fact to memory as you'll need to configure things a bit differently later on. You can move to the next section. If neither command worked as a normal user then try to run them with root permission (e.g. sudo openocd ..). If the commands do work with root permission then check that the udev rules have been correctly set. If you have reached this point and OpenOCD is not working please open an issue and we'll help you out!